Sodium tripolyphosphate: High concern for general ecotoxicity. Methylchloroisothiazolinone: High concern. The US EPA reports the LC50 value is very toxic to aquatic life. Antiredeposition agent: Moderate concern for cancer, respiratory effects, kidney and urinary effects, general systemic/organ effects; and some concern for chronic aquatic toxicity, skin irritation/allergies/damage. Troclosene sodium, dihydrate: Moderate concern for chronic aquatic toxicity, acute aquatic toxicity, respiratory effects; some concern for general systemic/organ effects, developmental/endocrine/reproductive effects, cancer, kidney and urinary effects, nervous system effects, digestive system effects, skin irritation/allergies/damage, damage to vision. Oxybenzone: Moderate concern for developmental/endocrine/reproductive effects. It turns out, you might not even need rinse aid. 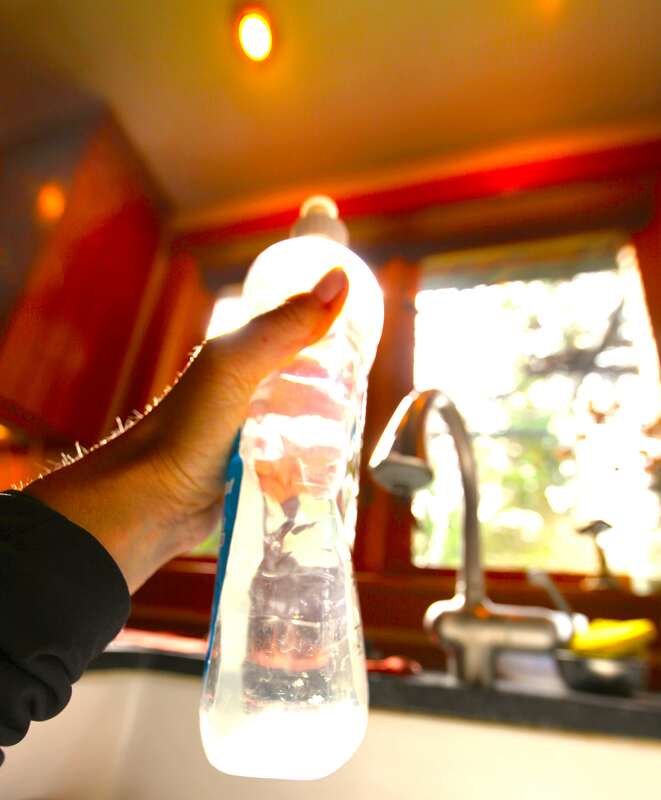 If your water isn’t hard, the little droplets left over on your dishes won’t leave a residue on them. Test your water, or better yet, go without rinse aid for some time and see what happens. 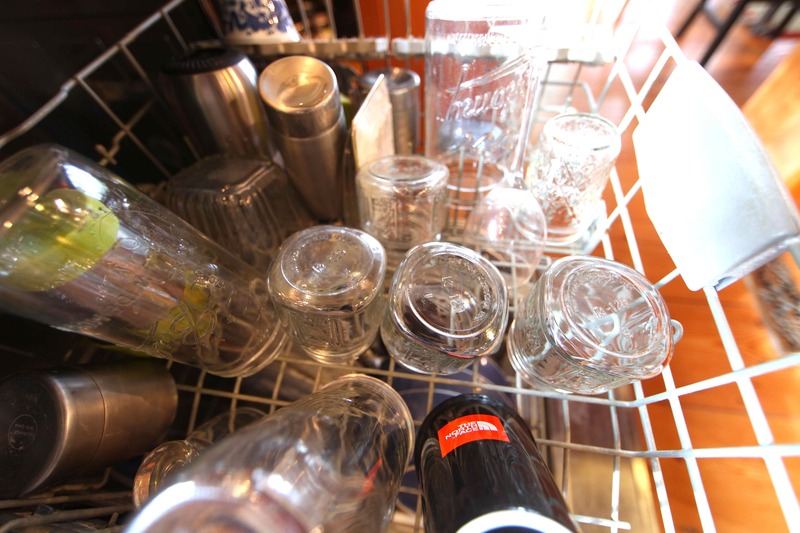 But first, if you have residue on your dishes and glassware, cut the amount of detergent you use by half. Chances are you’re using too much. That’s all you need. Replace your rinse agent with vinegar and you’ll get the same if not better results. But a word of caution: if you have rubber parts in the slot where the rinse aid goes, don’t put the vinegar in there. Apparently, vinegar can corrode rubber. I know of some people who skip putting the vinegar in that special slot for the rinse aid and just put it in a small cup in the upper shelf so it can splash out over time. Either way, you’ll save a bundle, reduce your plastic footprint and keep chemicals off your plates and out of your gray water. The interior of our dishwasher is metal and we’ve used vinegar now for over 3 years with no problems to the parts. 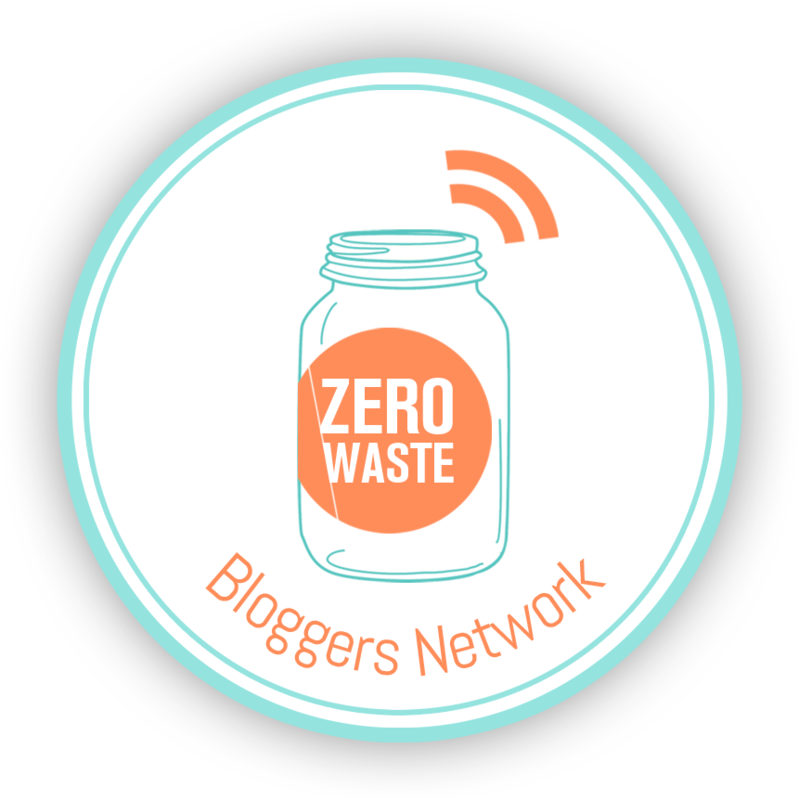 I’m not sure how a plastic-interior dishwasher will take to vinegar in the reservoir and would love to hear from others who have used it. 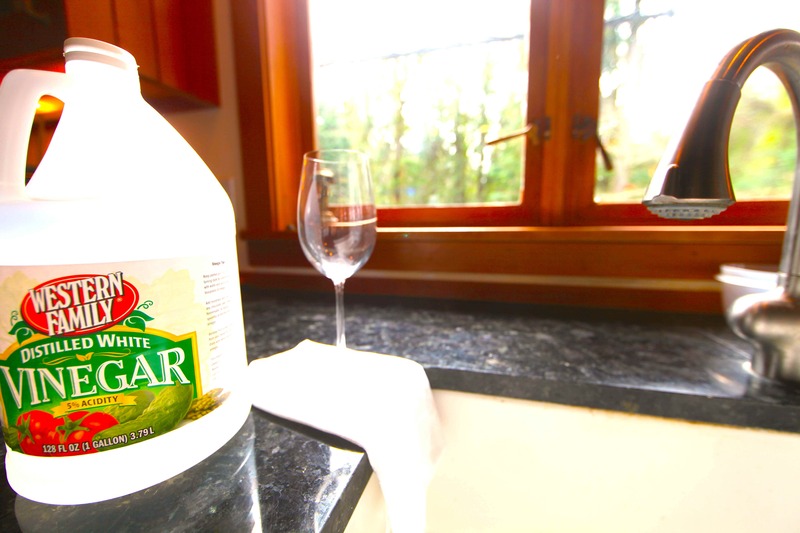 We buy our white vinegar in bulk and then put the vinegar for our rinse aid in a plastic bottle that squirts. It’s stored under the sink right next to the dishwasher. 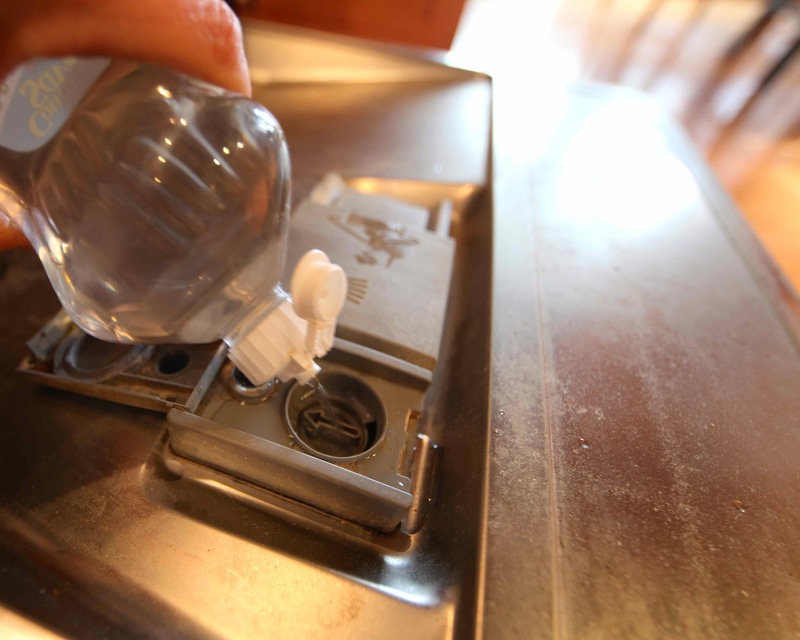 You’ll likely find a good bottle in your own trash to reuse as your vinegar rinse aid dispenser, or simply reuse your rinse aid bottle. We use water and vinegar to de-calcify the kettel. Later I use this mixture to clean the bath or as an addition to the dishwasher 😉 So you use it twice.